We’ve seen some other posts on the OSI blog about this, but I wanted to give the readers my two cents on this topic. Although my mother would argue priorities for choosing shoes should be style and color first; fit, comfort and function come second. The Athletic Trainer in me would have to disagree. But what I have found is that you can get both when looking for a good running shoe. There are a couple things to consider to get a good fit. Most importantly know what size of shoe to get! If you go into any shoe store they will measure the length and the width of your foot. Finding your size is a great place to start. Secondly, what kind of running are you doing? If you are trail running you are going to want a shoe with more traction, stability and support. If you are running mostly on roads or paved paths, you will want a lighter, more flexible shoe. The sole is a little less rugged in a road shoes compared to trail shoes. The third is looking at what type of arch your foot has. A good way to do this is if you have wet feet take a step on the cement and look at your footprint, or take a walk on the beach and see what your foot print looks like. Here is a diagram of what different arch types are. 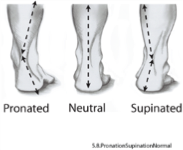 The last major thing to know about your feet is; are they supinated? Most of the pressure is on the outside edge of the foot. Are they pronated? Most of the pressure is on the inside edge of the foot. Or are they neutral? That is when there is equal pressure around the foot. They sell shoes specifically for pronator’s, supinator’s and the neutral foot type. You can also look at some shoes you have worn for a while and see where the soles are run down. That will give you a good idea where you place most of your weight while walking. If you have questions about your foot type and need help deciding what type of shoe to get, talk to your Athletic Trainer or Physical Therapist, we can help you out. Great information! I need to investigate my arch to find a better fitting shoe.